In yesterday’s big sell-session, Biotech and Health Care stocks were among the biggest laggards of the day. 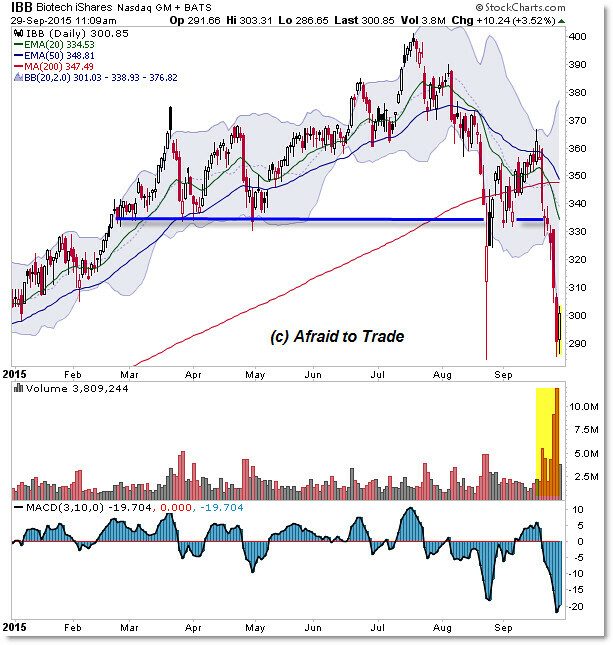 Let’s take a look at the strong rally in 2015 that gave way to a bust or reversal recently. A strong rally in July – continuing a strong uptrend through 2015 – occurred on reduced volume into $400 per share. From there, price simply retraced to the rising 50 EMA – nothing unusual – and then broke impulsively under this level at the beginning of August on high sell volume. When the market collapsed, Biotechs (NYSEARCA:IBT) collapsed with it, falling from the $400 peak to spike-reverse off $300. 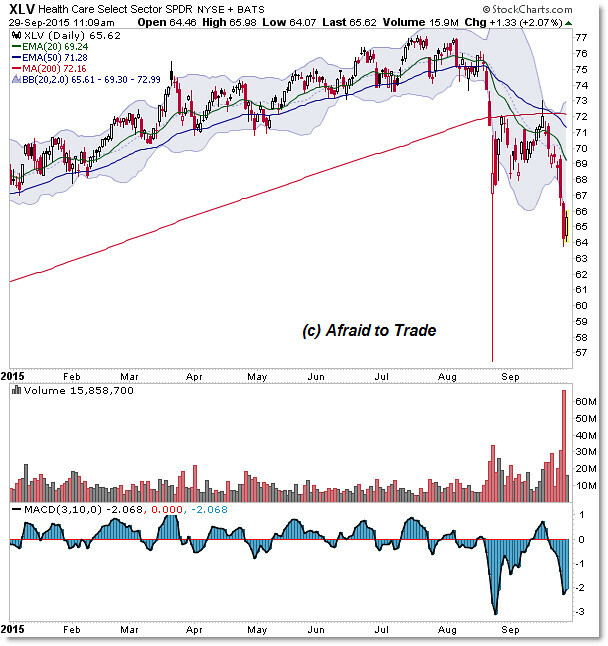 A logical and expected “ABC” Retracement pushed the ETF back into the underside of the falling 50 EMA at $360, but the trend took a turn for the worse when shares collapsed last week on increasing sell-volume. At this point, we’re seeing an oversold rally develop off the $290.00 spike low and an upward pathway potentially opening up toward the $330.00 pivot again. Nevertheless, focus your attention for the moment on $290.00 and $300.00 per share. Likewise, shares peaked in July on reduced bullish volume into $77.00 per share in the XLV ETF. From there, all seemed well – except for the pick-up in sell-volume through August – until shares tumbled three fateful days in a row in August. A mini-flash crash collapsed the price toward $57.00 for a brief moment ahead of a similar “ABC” Retracement toward the underside of the falling 50 EMA. From there, shares began a renewed tumble lower on the highest volume bars of the year. XLV shares are pivoting higher off the $64.00 level potentially toward $68.00 if we’re seeing another V-Spike Reversal. Either way, note the current levels, the rapid transition from a strong to a weak trend, and the current volatility in these funds.